The US and UK governments forcibly expelled an entire population of islanders to make way for a military base. It’s time to let them come home. One week after British voters decided to exit the European Union, the UK Supreme Court was set to decide the fate of a small group of British citizens who had no such vote when the UK and US governments forced the people to exit their homeland beginning in the late 1960s. Known as the Chagossians, these little known refugees have long been denied the kind of democratic rights exercised in the Brexit referendum. Instead, Britain and the United States forcibly removed the Chagossians from their homes during the construction of the US military base on the isolated Indian Ocean island of Diego Garcia. Over nearly 50 years, the base has become a multi-billion-dollar installation, playing key roles in the US-led wars in Iraq and Afghanistan. Over the same period, the people have lived in impoverished exile, mostly on the western Indian Ocean islands of Mauritius and the Seychelles. Before the recent ruling, Chagossians waited anxiously to learn if they would be allowed to return to their homeland. The history of what The Washington Post’s editorial page called an “act of mass kidnapping” dates to the time of US independence. In the last decades of the 18th century, the ancestors of today’s Chagossians first arrived in Diego Garcia and the rest of the Chagos Archipelago as enslaved and indentured African and Indian laborers who worked on Franco-Mauritian coconut plantations. Following emancipation and Britain’s seizure of the Chagos islands in 1814, a new, indigenous society emerged. Unfortunately for the Chagossians, in 1958, US Navy officials identified Diego Garcia as an ideal location for a base. 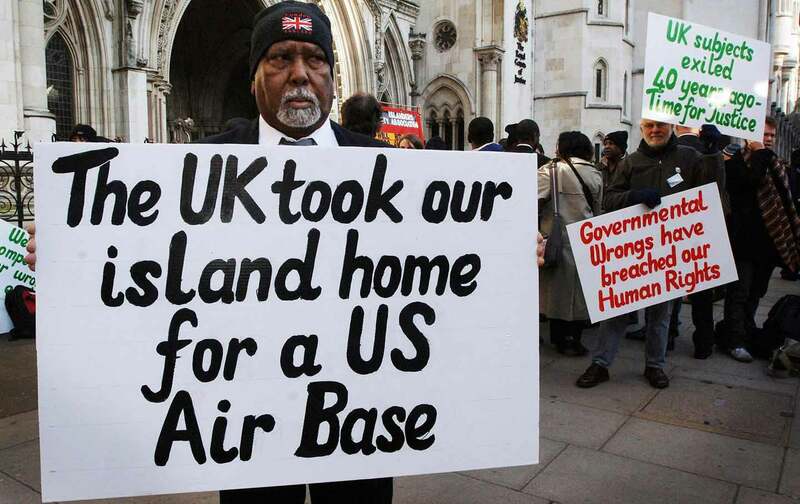 By 1965, high-ranking US officials had convinced the British government to detach the Chagos Archipelago from colonial Mauritius (contravening UN decolonization rules) to establish the United Kingdom’s last-created colony, the British Indian Ocean Territory. During secret negotiations, US officials insisted the territory come under their “exclusive control (without local inhabitants).” With the help of $14 million quietly transferred without Congress’s or Parliament’s knowledge, British officials agreed to take “administrative measures” to remove some 1,500 Chagossians. Between 1968 and 1973, the two governments concealed the expulsion from the world. If anyone asked, Anglo-American officials decided to “maintain the fiction that the inhabitants of Chagos” were “transient contract workers,” as one bureaucrat explained. A British official called the Chagossians “Tarzans” and “Man Fridays,” in a tellingly racist reference to Robinson Crusoe. British representatives forced Chagossians to board overcrowded cargo ships and deported them 1,200 miles to Mauritius and the Seychelles. While the people awaited deportation, British agents and US Navy personnel rounded up and killed the Chagossians’ pet dogs by gassing and burning them in sealed cargo sheds. Since the expulsion, Chagossians have demanded the two governments let them return home. After years of protests and hunger strikes, some won compensation payments from Britain in the late 1970s and early 1980s totaling around $6,000 per person. Chagossians in the Seychelles received nothing. In the 1980s, some Chagossians also realized they were UK citizens because of their birth in a UK colony—a fact conveniently hidden by British officials. UK citizenship has since enabled a long legal struggle, which landed Chagossians in the Supreme Court this summer to hear if they might be able to go home. In 2000, the Chagossians briefly won the right of return when a lower court ruled their expulsion unlawful. Lacking the money to resettle the islands immediately, Chagossians were shocked when in 2004 the British government reimposed the ban on entering Chagos. The government did so by employing an archaic royal prerogative to make laws for Britain’s colonies without parliamentary or local approval. That is, in the name of the queen, the government asserted a colonial right to make laws for the Chagossians without their consent. When Chagossians challenged the renewed ban, they won again in 2005 and, after an appeal, in 2006. On the government’s final appeal, Britain’s highest court at the time, the Law Lords, upheld the exile in a 3-2 decision. The latest suit asked the new British Supreme Court to reopen the 2008 case because of what judges called British officials’ “regrettable” and “reprehensible” failure to disclose relevant documents in the earlier litigation. In another 3-2 decision, however, the Court dismissed the Chagossians’ petition. While the dismissal and initial news coverage suggests a crushing defeat, the majority opinion surprisingly supports Chagossians’ hopes for a return. The Chagossians’ “defeat” thus puts new pressure on both governments to allow a return. If not, Britain will face years more of costly litigation. The United States should be equally culpable, having dreamed up the base and paid for and ordered the expulsion. With President Barack Obama and Prime Minister David Cameron facing their last months in office, a two-year period to renegotiate the original 1966 base agreement provides an opportunity to remedy the injustices Chagossians have suffered and a stain on both our democracies. The Obama administration must state publicly that the United States does not oppose resettlement. Cameron’s government must restore the right of return. Both must assist with resettlement efforts.